Newly created. There are 3 loops of wide and fast singletrack (could be termed doubletrack because of width). Smooth and fast. Can catch air on trail in some sections. Not too much for climbs near the lodge. Novice to intermediate riding level. Scenic views of Broken Bow Reservoir. Hiking trail too. Camping nearby. No fees (?). Review: Good trail and well-maintained for the most part. A few rock gardens and plenty of roots to keep you on your toes. Several trees (6-8) laying across the path when I rode it. Had to carry bike around/over. A trail that was an 8 and weather that was a 10 made for a great day. Review: Other reviews were pretty spot on for this Trail. It was really great flow, some challenging spots. The terrain is rocky with roots, the Trail seemed very well kept, only one fallen tree not cut away. The loops are now clearly marked. Super fun, a couple great views in the back part of the Trail. Review: Trail is rocky with exposed roots. Very fun and challenging. I enjoyed the 4 mile loop. Pay attention to the loop turn offs as they are not marked. We went the wrong direction with realizing it until we were 2 miles into it and went uphill for about 3 miles. So, that was a challenge. Watch for fallen trees, as this is in the forest so that's going to happen. The trail is fairly maintained and in good condition. Just needs to have trail markings of where the direction is. Review: Lots of downed trees that need to be removed out of the path. Fun track but the trees in the way got more annoying as I rode on. Chainsaw would make the rating a 4-5.
Review: Very nice XC type trail. The trail has settled into a nice single-track, Nothing technical, just a few small rock garden, and short steep sections, Good trail for beginner/ intermediate riders. More advanced riders can have fun too, has nice flow for fast riding. Trail was designed with input from OEF, and built by Arrowhead Trails Inc.
Review: Rode on 4/27/13 after a light rain. I had the trail to myself. It was a well maintained trail with a few trees across it that had just fallen. Some I had to carry the bike over/around. Not much elevation change. I went the longest loop (loop 3) the went back for more (loop 2). At one point, loop 3 intersects a gravel road. A sign was missing at the point you should exit the road and get back on the trail. That cost me some time and a massive climb but I didn't mind. Fun trail. Somewhere between beginner and intermediate. Some of the trail is rocky. Several low water crossings were wet today and there were no bridges. Views of the lake on the north side of the trail. Not much but woods and ravines on the south side. I'll come back again. I had fun. Review: This trail grew on me. I was disappointed with the first circuit as the scenery was not quite what I expected (limited views of the reservoir) and the speed and features were not what I had hoped for. However, in subsequent circuits I had a pretty good time. I think those who are new and seasoned can have a good time on this trail. The sad thing is with improvement this could be a very good trail--the topography of the area is awesome and this could have killer downhills, corners, jumps and so forth. As is, you've got some moderately fast sections and some moderate elevation gain and a few obstacles that require attention. The trail was overgrown in several sections and had large branches but definitely managable. If cleaned up I might give it 3.5 stars. I sprayed with Deet heavily but still had a tick and mosquito attacks if stopping to take in the view. It is in a heavily treed area, so sun is not an issue. I rode both directions. I found clockwise a little easier in terms of physical effort and obstacles, but I like counter-clockwise better. My average times were about 27 minutes for all the loops, without going full bore but at a pretty good pace. The trail guide stating 10 minutes is inaccurate--that would put the speed at about 24 mph. So don't let the apparent short lap time dissuade you. I wouldn't travel here just for the mountain biking, but if you're going take the bike along. I will next year. The trail appears to be lightly used by bikers. I saw no one on the trail. Similar Trail: A reviewer said Johnson Branch North of DFW area. It has some elements of that trail, but not as rocky and I actually prefer Lake View Lodge Trail. Review: This trail was a lot of fun. Kinda easy going for the most part. A few rocks and roots but nothing overbearing on the ride. The views of the lake you'll get along the way are amazing. I did cross paths with quite a few bugs, but with some spray there were no worries. Riding in the shade the whole time too, so the heat during summer riding is reduced greatly. Enjoy. Review: Recently road this trail with my wife and brother-in-law during a family getaway in broken bow. None of us are experts but we had a blast on the 2 short trails. We didn't get to ride the long loop due to time. Some rocks in places as well as creek/gully crossings. I went over the handlebars once and got a nice black eye but it was because i was going to fast on a trail i didnt know. I knew my wife was going to like the MTB thing when she started laughing on a nice downhill (like she does on a roller coaster). 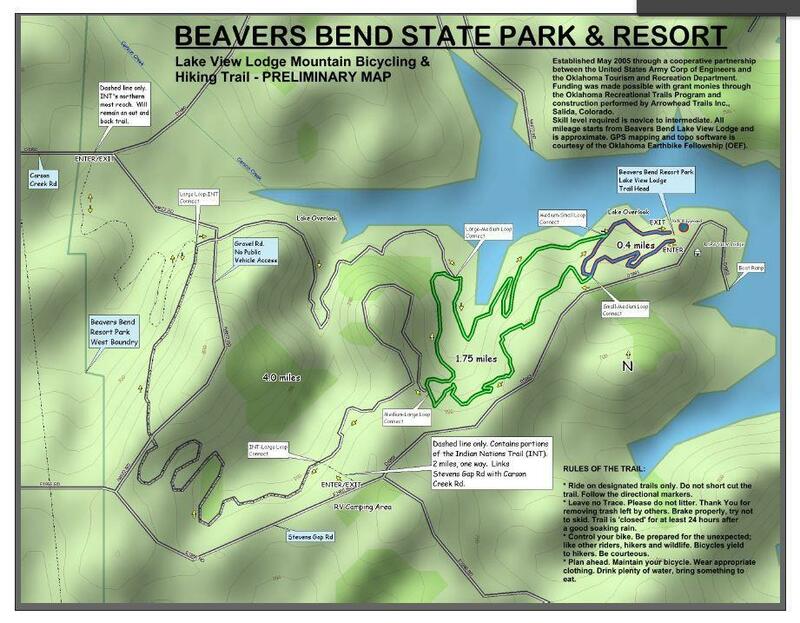 Didn't look like there is much bike traffic on the trail but if you are in the area try it out. Well worth carrying the bikes from the DFW area. Lake View Lodge Mountain Bicycle & Hiking Trail MTB Trail 3.67 out of 5 based on 12 ratings. 12 user reviews.